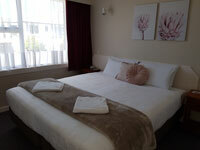 554 Moana Court Motel offers spacious studios, 1, 2, and 3 bedroom units in Invercargill. These units are perfect for single, couples, families, sports groups and business travellers alike. 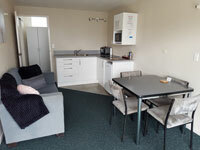 All units have excellent cooking facilities, Wireless Internet, flat screen TV's, Sky TV, and a DVD player available at reception, all units serviced daily. 554 Moana Court Motel is the closest motel to Bill Richardson Transport World, the Velodrome, Stadium Southland, Surrey Park Softball and Soccer, Badminton Hall and Athletics Stadium, Netball Courts. Allergy free environment for guests with cleaning chemical free using the Enjo microfibre system in conjunction with a Lux steamer. All units are conveniently located on the ground floor, with parking right outside your door. Unit 2 is a 2 bedroom wheelchair access units.For a full list of accommodation options and motel facilities, please see below. Studio unit has a queen-size bed, cooking facilities are 2 hot plates, microwave and electric frypan. The room has an ensuite with wet floor shower. Sky TV, . Wireless Internet. Netflix Ground floor unit with car parking at the door. We have 2 units available with full stoves, microwave, electric frypan and 2 Units with 2 hot plates, microwave, electric frypan. 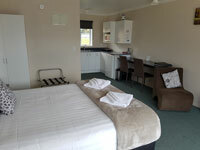 3 units have a King bed in the bedroom and a single bed in the lounge area, the King beds can be split into 2 singles. The other unit has a queen bed and a single bed in the bedroom, and a single bed in the lounge area. 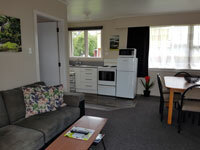 All have flat screen TV's, Sky TV, Wireless Internet, Netflix Good parking in front of the door. 2-bedroom unit with a queen-size bed and 1 single bed in 1 bedroom and 2 single beds in other bedroom. Cooking facilities include 2 hot plates, microwave and electric frypan. This is a wheelchair-access unit. Flat screen TV, Wireless Internet, Sky TV, Netflix Good parking in front of the door. 3 bedroom unit, 2 rooms with 2 single beds, 1 room with a queen and 1 single bed. Full stove, microwave, fridge/freezer. Flat screen TV, Sky TV, Wireless Internet, Netflix. Good parking at front of the door. Cooking facilities - full kitchens, microwave, electric frypan. Convenient location for corporates with good parking at your door and spacious units. Secure garage for cycles and motor bikes.